I am happy! Hockey season has started! What does this have to do with glyphs you ask? But first, I’ll go over the new glyph system briefly and then follow it up with a quick review and opinion of the glyphs going into patch 4.0.1. Except I will be going at them in the style of a fantasy hockey pool analyst. Prime – Straight increase to damage or healing. Major – Offers extra stuff to existing spells or abilities. Minor – Convenience or cosmetic changes. When you learn glyphs, you do so permanently. You won’t have to keep buying glyphs repeatedly if you’re changing specs or styles. Once you learn it, that’s that. However, in order to switch a different glyph in, you need to use something called Dust of Disappearance (For 80 and below, we’re looking for Vanishing Powder). I’m going to break down the glyphs into the three major categories. Some are obviously meant for holy, discipline or both. Others have utility applications and would be valuable in select situations. First, we’ll look at the primes. And I don’t mean Optimus, either. Glyph of Flash Heal (B) – Having a 10% increased critical effect chance for Flash Heal on targets below 25% will help cement healing at level 85 especially when targets get that low (and they will). Great on the clutch play and will come through when you need it. At level 80 though, you can pass on this glyph. Not likely anyone will be dropping that low. Good mid range pick. Next season his value should sky rocket. If you can’t find anything else as holy, then it becomes more of a “sure, why not” selection. Glyph of Guardian Spirit (H) – I personally view this glyph as a nerf from its 3.3.5 iteration where the cooldown was dropped to 1 minute if it didn’t proc. As Holy, I’ve extremely aggressive with Guardian Spirit. Unfortunately, Guardian Spirit glyph didn’t do so well in training camp. It went from an extremely hardworking and beneficial glyph to a slower but more consistent glyph. Good veteran locker room presence, however. Pass on this at 80 if you wish. Lowering Guardian Spirit to 2:30 isn’t all that bad (proc or no proc). Glyph of Lightwell (H) – The potency of this glyph is dependant on your raid. If they’ve been raiding with Lightwell, then this glyph might be of benefit to you. Lightwell has had some unfortunate seasons over the past few years. He’s been on a variety of different teams, but most teams simply struggle with him because they haven’t quite figured out how to use his presence best. With the right team, he’d be an awesome healing scoring presence. Mattwell says to pass on Lightwell. Glyph of Penance (D) – By default, Penance is on a 12 second cooldown. This glyph is a virtual requirement for discipline priests to be effective in their roles. Even though Train of Thought helps in the reduction of that cooldown, you’re better off glyphing for this anyway. For team discipline, this should be your first overall draft pick. Glyph of Power Word: Barrier (D) – I’m going to write more about this glyph in a future post. It just got me thinking a lot about the usage. Barrier is a new glyph just fresh out of the junior glyph league. He showed some flashes of talent and raw ability, but coaches will need to experiment with him on different lines to see what he’s capable of doing. The young product of Absorbsville is going to need to earn himself a spot on the opening night roster. Good to draft if you have nothing better. Glyph of Power Word: Shield (D) – The shield glyph has routine put up strong numbers in the HPS department. Team discipline simply cannot go wrong anywhere with this pick. Technically, you can use this glyph for both specs, but there is a clear edge to discipline here. Discipline shields have also been traditionally stronger (especially now coupled with the mastery). This glyph is priority number two for discipline. Draft it. Glyph of Prayer of Healing (B) – I’ve always preferred using this glyph in both of my specs just because it added extra AoE healing power. It doesn’t completely restrict AoE healing for discipline but it amplifies AoE healing for holy. Prayer of Healing has often been overlooked but when you need stability and coverage during frantic moments, he will have your back. And that other guy’s back. And yeah, even that guy. Excellent draft pick if you need a third slot and can’t seem to find one that really benefits you or the encounter your group is going for. Glyph of Renew (H) – This glyph has holy all over it. I suppose you could use it for discipline, but it just isn’t as powerful. If there was a first round draft pick for team Holy, this would be it. He’s fast, he’s got great hands, he knows what he’s doing and he will get the job done quickly and efficiently. No contest. Draft it for holy. Next up is the majors. Glyph of Circle of Healing (H) – No big change here. Instead of healing 5 targets, it heals 6. We all love smart heals. Team holy will once again wish to pick him up to hold down the fort. Glyph of Dispel Magic (U) – Not too sure about dispel magic here. He’s a bit of a grizzled veteran. Seems to come out when things get a little rough especially when it comes to some PvP action. At the very least, even if your dispel whiffs and you miss or someone beats you to it, it won’t be a complete waste as it restores 3% of their health. More of a situational role player, in my opinion. Glyph of Divine Accuracy (U) – Need some muscle? This enforcer glyph will help. Granted the team isn’t known for packing a whallop, but used in tandem with Smite (either for leveling or if you’re going for the Atonement build), you will want this glyph. Situational draft pick. Depends on your team. Glyph of Fade (U) – I can see this glyph coupled with both the Phantasm and Veiled Shadow talents for really fast movement debuff clearing. Typically, healers aren’t going to be generating a ridiculous amount of threat anyway. I haven’t pulled threat on the beta either but that could be due to having really good tanks and crowd control. Pass at 80. Situational pickup otherwise. Glyph of Fear Ward (U) – At the core of it, it just means priests can cast Fear Ward more often if they need to. Can’t say it has a lot of PvE applications right now (maybe the third mini boss on Halion, if that). Seems more PvP utility to me. Glyph of Holy Nova (B) – In preseason, Holy Nova came in just blasting (literally). He was bugged where it had no cooldown and it just levelled the opposition no matter what they were. You could bind it to the mouse wheel and just go to town. Luckily, that has since been fixed and is now at a more stable level. Holy Nova causes no threat. The strength of Holy Nova is divided by the number of targets healed, remember. Another decent AoE booster. Wouldn’t be opposed to drafting it for either spec. Glyph of Inner Fire (U) – No. Just no. There are other options. Glyph of Mass Dispel (U) – Very cool glyph to have. A 0.5 second cast that removes something like 10 magic abilities? To me, this would be a unanimous pick for all specs. It used to be restricted to discipline only since it was a talent. 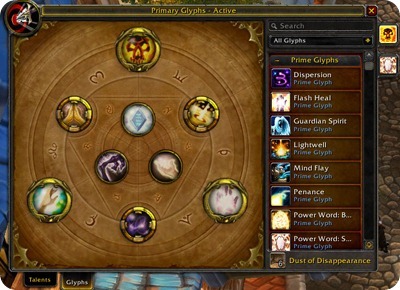 Glyph of Pain Suppression – (D) Not only is it meant for discipline priests, but the PvE application is extremely low. This is clearly meant for PvP. If that’s what your interested in, then yeah pick this one up. It’ll come in handy. Glyph of Psychic Scream (U) – Surprisingly useful in instances as emergency forms of CC. 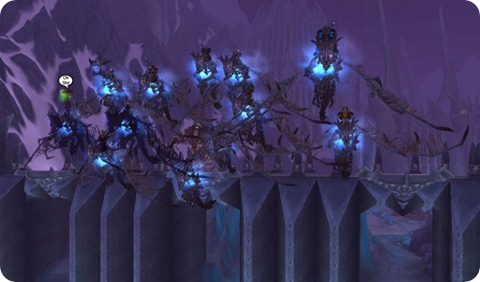 Fear bombing them means the mobs won’t run all over the place but it prevents them from doing stuff. Pass on it for now, but don’t forget about it when you’re grinding instances. Glyph of Smite – Pairing Smite with Holy Fire just got a whole lot better. This duo will do wonders. Almost like an extra boost to healing if you’re into Atonement (in which case, you should get it). Get this for leveling, but you can probably pass over this at 80. Glyph of Spirit Tap (U) – Purely for leveling purposes. Ignore it otherwise. Glyph of Spirit of Redemption (H) – You know, as a priest, you shouldn’t plan on dying as a strategy. Rather nice to have, I suppose. Now it’s down to the minors. Glyph of Fortitude – Draft this. There will be times when players die and they will resurrect mid fight. Fortitude is one of the must have buffs they should have once they come alive. Glyph of Levitate – Draft this as you never know when you’re going to go flying off a ledge. Glyph of Shadowfiend – Draft early in the event your Shadowfiend dies. It won’t be a total less as sparky will still grant you some mana. Glyph of Shackle Undead – Pass. Nothing to add here. Glyph of Shadow Protection – Pass unless you don’t have any other forms of shadow protection like Paladins. Otherwise, it becomes unnecessary. And that’s that! I suggest hitting the local auction house and grabbing glyphs cheaply (if they’re there).